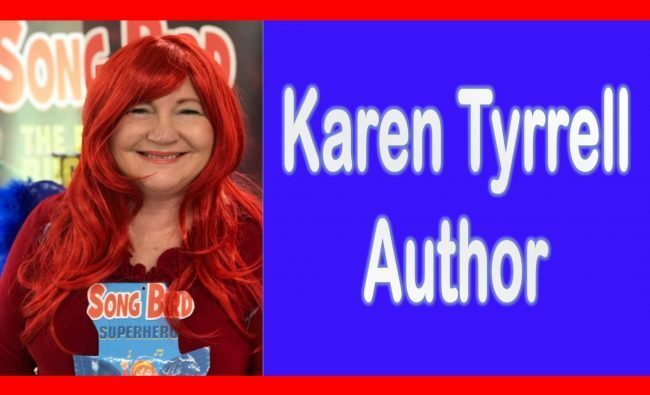 Award-winning author, Karen Tyrrell and teacher presents interactive pantomimes, inspirational talks and engaging writing workshops, empowering kids and adults to live STRONG through humor and self-belief. 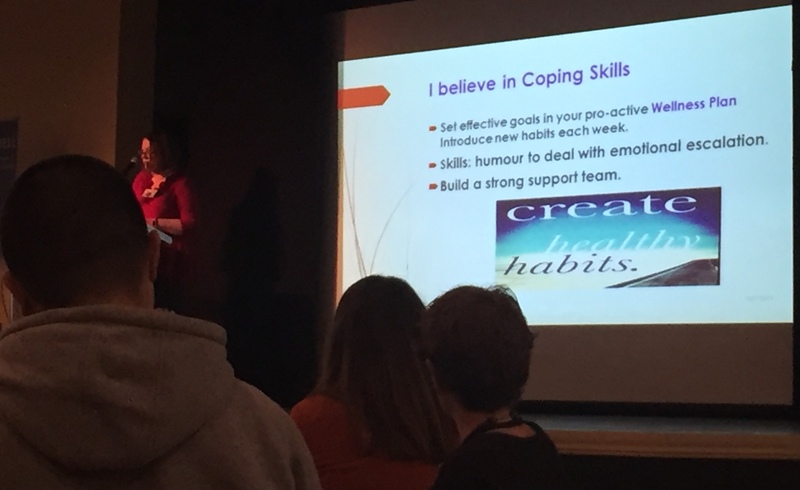 As a survivor of workplace bullying, Karen shares bully prevention, resilience, self-care and coping skills at conferences, festivals, schools and corporate workplaces. 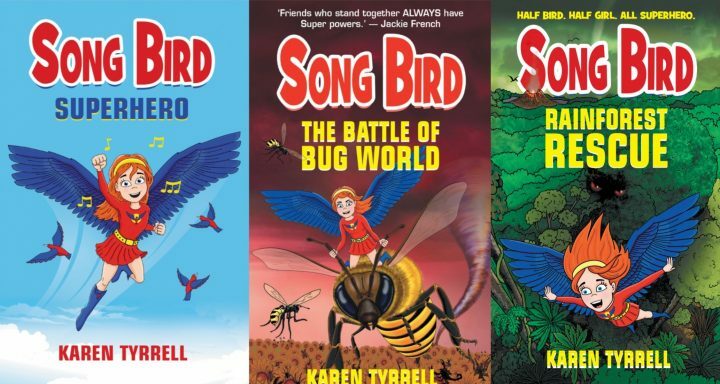 Karen Tyrrell author won 3 awards, 4 grants, 3 sponsorships and a mentorship from Society of Editors QLD. 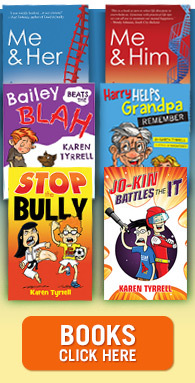 Karen’s kids books, Bailey Beats the Blah and STOP the Bully, are endorsed by Kids Helpline. Harry Helps Grandpa Remember won a RADF grant and is endorsed by Alzheimer’s Australia. Recently, Karen won an Arts Queensland grant for picture book, Ready Set Discover Logan. KAPOW! 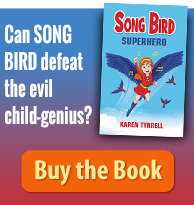 Meet Superhero, Karen Tyrrell Author of the Song Bird Superhero series dressed in character. 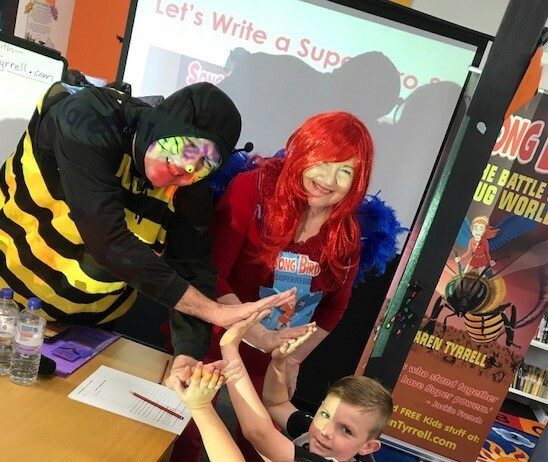 Kids will be supercharged with story writing powers to create an original SUPERHERO story, jam packed with SUPER powers, SUPER action and SUPER villains. Steve co-presents too. 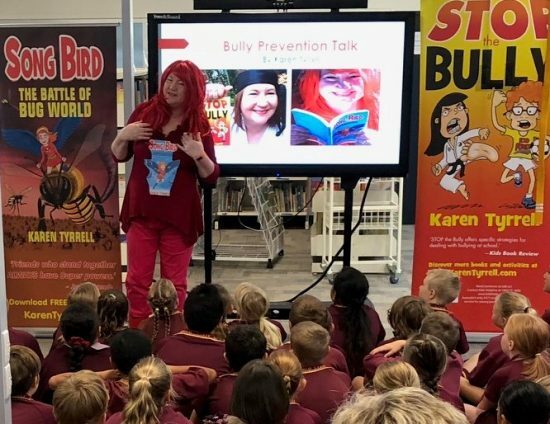 Karen wears her Song Bird Superhero costume or taekwondo outfit to present bully prevention talks. She shares approved and effective strategies for bully prevention for students, teachers and parents. Many describe her talks as inspiring, educating and engaging. 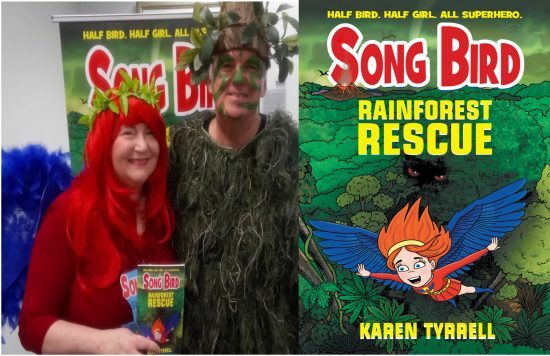 Karen and Steve Tyrrell presents interactive storytelling and pantomimes to children. 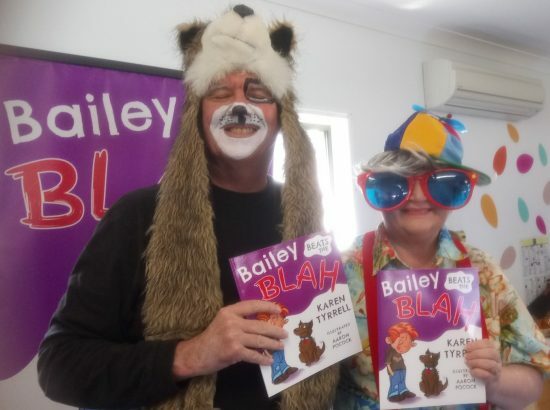 Us authors, get into character, wearing FUN costumes. We educate children on social skills, self-care OR how to write engaging stories and characters. We present all 9 children’s books in costume and pantomime. Karen Tyrrell and Steve Tyrrell presents ECO talks on saving bees, trees and the environment. Power point presentation includes interactive talks, dramatic book readings and Q&A. 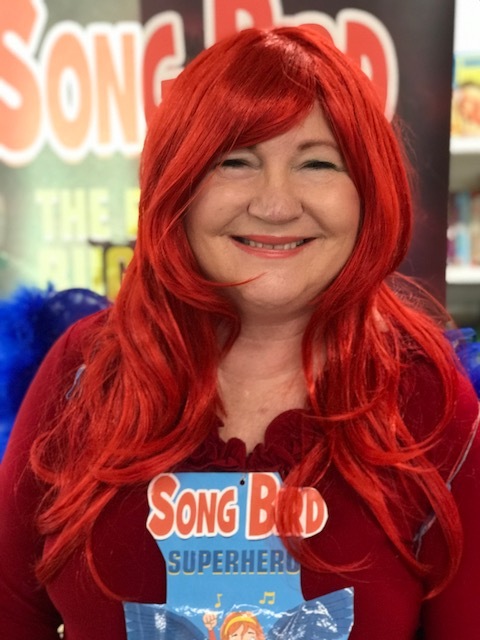 Dressed as Song Bird Superhero, Super Bee or Tree Man, we present empowering talks jam-packed with positive strategies. Talks focus on how kids can be involved and RECYCLE … REUSE … REDUCE at home and at school. Our talks are all about kids believing in themselves, connecting with their inner superheroes and making a difference to the planet. Karen presents practical writing workshops for adults and teens, guiding them to create and publish memoirs, picture books and junior novels. 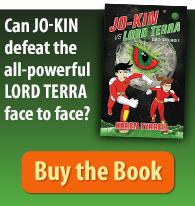 She shares how to create likeable characters and how to write a page turning story. Karen also presents Book Marketing Masterclasses. Karen speaks about how she recovered from parent-teacher bullying and PTSD when she was a bullied school teacher. Her memoirs Me and Her and Me and Him: A Guide to Recovery empower adults to live strong with self-care, resilience and coping skills. Resilience Power Point Talk to 250 teachers at a Sydney Teachers Conference. 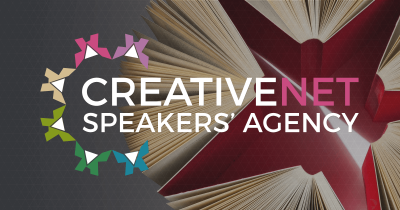 Speaker Agents – Please book below. 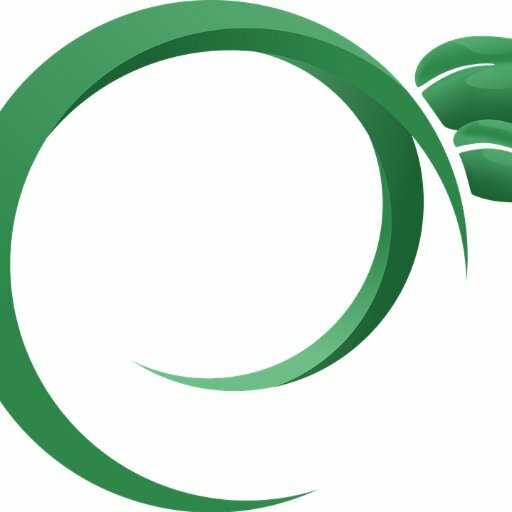 Please contact me with any questions … Click here. 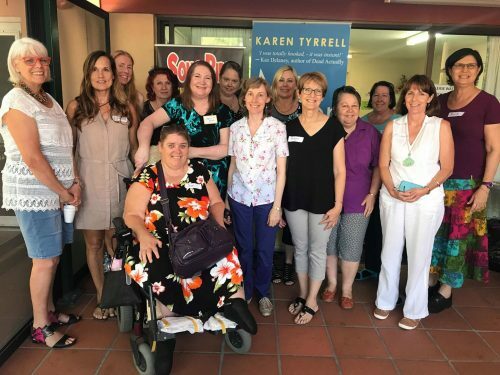 51 comments to Karen Tyrrell Resilience Author – Educate. Empower. Engage.